I was hired recently by Mark and Lavinia to shoot video for their wedding ceremony. 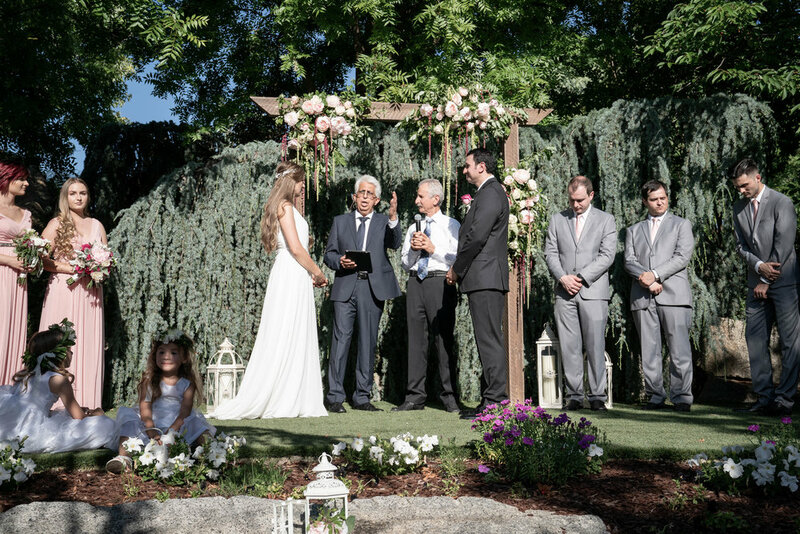 Their wedding took place at a gorgeous golf course location in Lincoln, Ca. I brought my trusty Panasonic GH5 along with two Sony mirrorless bodies and I was ready to go! I set up shop in a couple different locations so I could get differing angles of the wedding. The GH5 has no recording limit, so I set that guy up on a tripod and just let it go. My GH5 is primarily used as a static camera to provide a full-ceremony video. I feel that this camera gives the viewer the experience a guest would have sitting in the ceremony. My Sony cameras would travel with me either handheld or on a monopod. Though I was hired to shoot video and there was a photographer on-site, I always sneak in a few still images whenever I can. These images make great cover photos for videos and so far the clients have really enjoyed getting the extra shots that I provide - it's a little added value that's my little 'thank you' for hiring me. I'm always trying to give just that little extra whenever I can! The reception was challenging to video as it took place in a relatively dark room. Thankfully, I am able to provide ample lighting to make sure the video looks clean. This photo here isn't taken with flash photography. It's actually the ring light I brought to make sure everything was bright enough. Though I bring this equipment for myself, I am more than happy to let the photographer or any guests capture moments while it is out on the premises. As with all weddings, nothing goes completely right. But you wouldn't know it by seeing the photos and video taken. It's the photographer and videographer's job to make sure the wedding day looks perfect. Check out this little video I made for my videography service. I'm looking forward to making more of these little videos to show off what I can capture through the video lens. If you're interested in booking wedding videography or photography, please contact me ASAP. Dates are filling up very quickly!